It would be great to be a young princess, right? But what if you were a princess like Belle, and all you wanted was to be a clown? Princesses aren't supposed to swing from chandeliers, wear fuzzy orange wigs, pull coins from people's ears or other fun things. Will Belle be able to reconcile being a royal princess AND a clown? 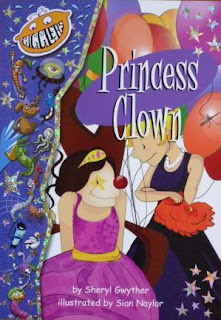 Princess Clown was written by Sheryl Gwyther, illustrated by Sian Naylor, and published by Blake Education as part of their Gigglers series. Gigglers are easy readers, books that support youngsters who are not yet ready for longer chapter books. Princess Clown does this by having lots of white space and illustrations to break up the text, large font, and simple sentence structure. According to Blake Education, it is perfect for kids who have a reading age of around 7. It's obvious Gwyther understands what kids want in books such as these, because the story, though simple, is such a fast-paced, enjoyable read. I really like the way the book is NOT dumbed down - instead, Gwyther has included words like banquet, chortle and souffle, words to provide interest and expand children's vocabulary. Heroine, Belle, is a character kids will relate to, one who is determined to follow her dreams. Naylor's illustrations are colourful and cartoonish. They add an extra dimension to the book by including some elements not specified in the text. Kids will love Belle's combination princess/clown costume! Details in such pictures also support young readers with text prediction, an important consideration in an easy reader. There are lots of great teaching points in the way this Giggler is set out. There's a character list, a table of contents, and an illustrated glossary - more opportunities for kids to read formats other than a narrative. Another feature I like is teaching notes which point out the story's orientation, complication, and resolution. They give teachers, parents and kids questions to think about before, during and after reading. Wouldn't it be fun to follow up reading Princess Clown with a dress-up day? Kids could organize their own circus, complete with clown acts and posters to advertise them. Young writers might like to take two unrelated nouns and develop a character and story to go with them - like princess and clown, dinosaur and dancer, farmer and duck. Do share with them that that is precisely the kind of prompt that started this story in the first place! You can buy Princess Clown from Blake Education, or find out more about the other books in the Gigglers series. Discover more about Princess Clown and its author by visiting some of the blogs Sheryl is touring right now. This post is part of the July I Can Read Carnival. Read more posts in this carnival at In Need of Chocolate. Book Chook, love your idea of linking a dress-up to reading 'Princess Clown'! Great Sheryl, thank you! I have tried and tried to juggle oranges but always end in splat. The only circus skill I ever achieved was swallowing fire, and that was most definitely a one off! Great to read a second review of this as part of the I Can Read carnival - I always find it fun to read multiple reviews of the same book. It tells me as much about the reviewers as it does the book ;-) This sounds like a fun book, and as you say with the possibility of many fun story extensions. I hadn't thought of reviews as revealing so much about reviewers until now, Zoe. My eyes are opened! I shall be alert to it henceforth!